Foreign citizens who want to move to the United States must first obtain legal permission. The permission you seek will depend on how long you want to stay in the U.S. and the reason for your move. 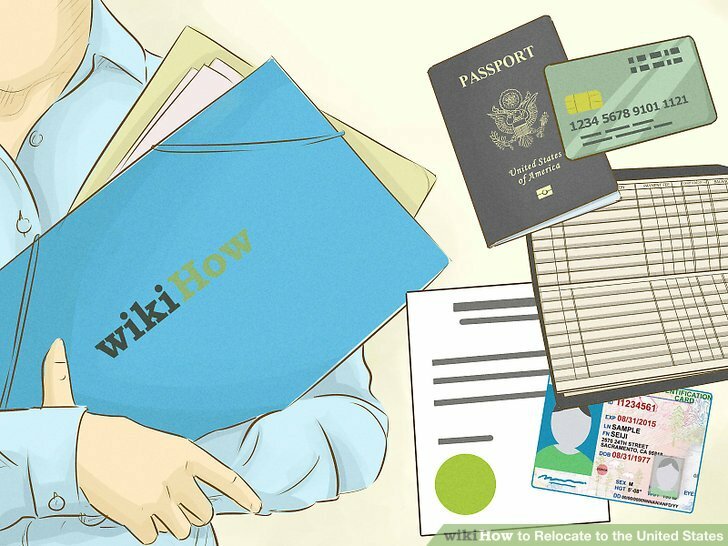 Once your legal documents are in order, you can begin finding a place to stay in the U.S. and start packing your belongings. Relocating to any country is a lot of work. 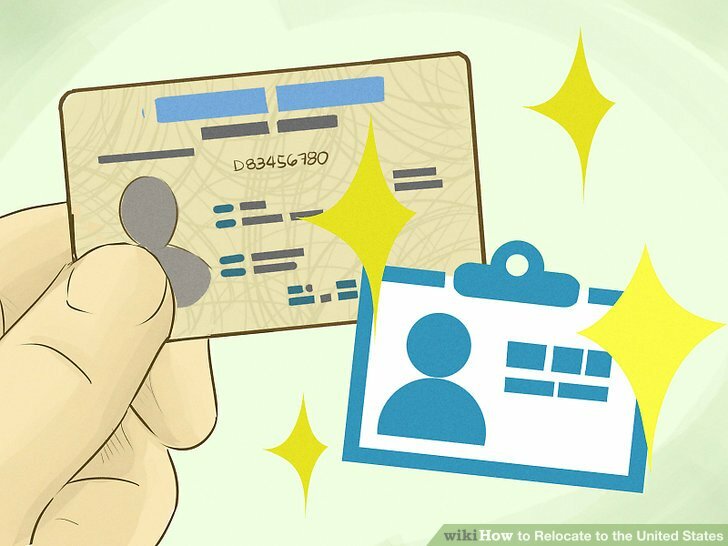 You must remember to obtain important personal documents before leaving and become familiar with the laws of the U.S.
Have an employer sponsor you. 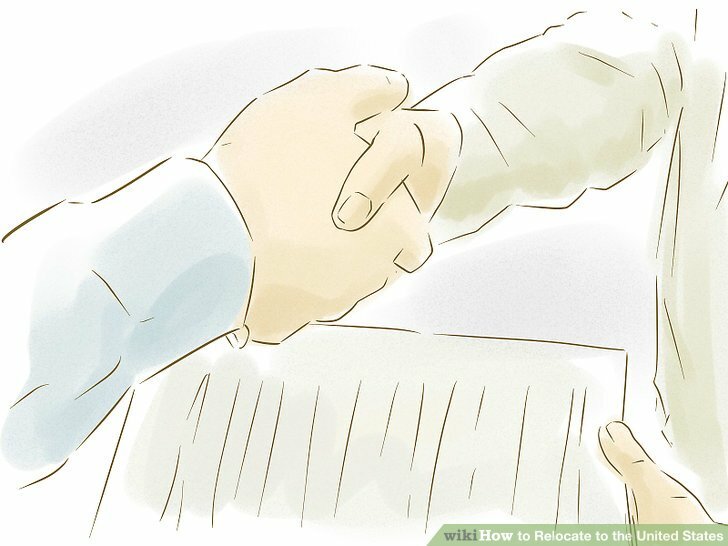 The easiest way to get permission to move to the U.S. is to have an employer sponsor your move. If a U.S. employer wants to hire you, then they can begin the process by filing a petition with the United States Citizenship and Immigration Services (USCIS). As the employee, you don’t begin the process. Instead, your employer files Form I-140 on your behalf. Gain sponsorship by a family member. Family members in the U.S. might also be able to sponsor you if you don’t have an employer willing to do so. Your family member starts the process by filing a Form I-130 petition with the U.S. government. 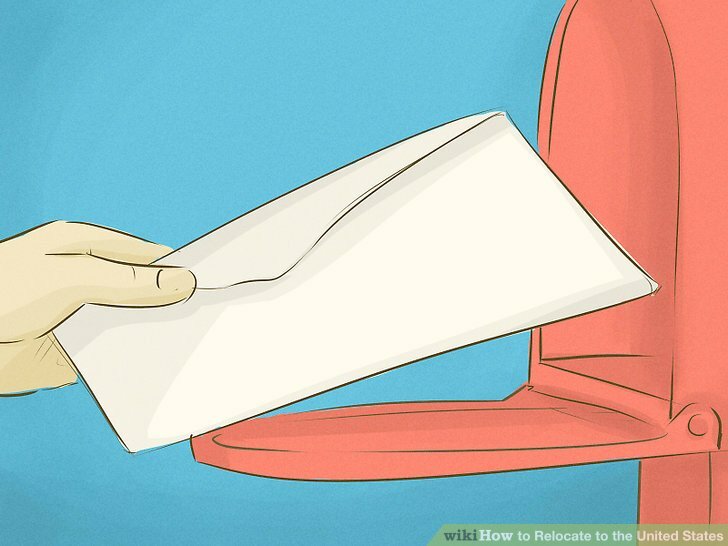 Once the petition is approved, you go through consular processing in your home country. 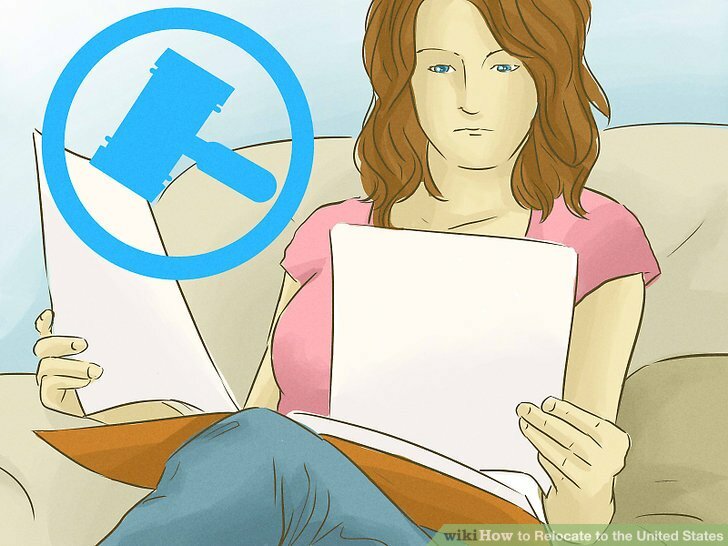 A U.S. citizen can immediately petition for a spouse, unmarried child under 21, or parent to move permanently to the U.S.
A U.S. citizen can also petition for a married child, unmarried child over 21, or sibling. However, they don’t have priority and must wait for a visa to become available before they can move to the U.S. 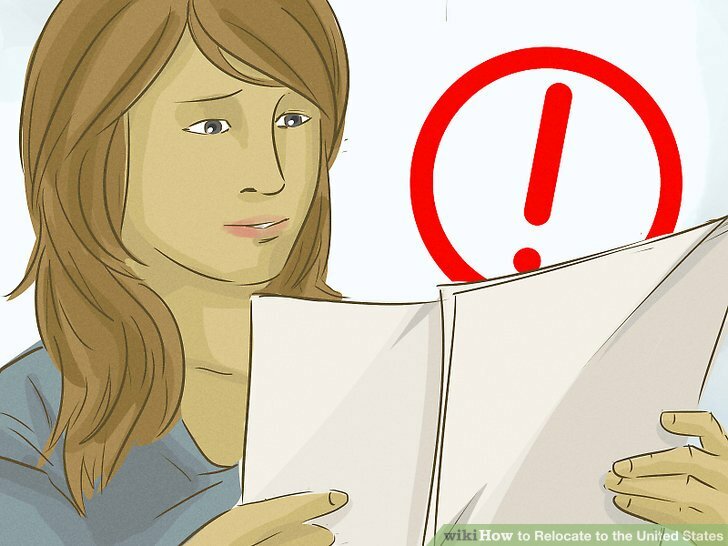 If your family member is a green card holder, then they can petition their spouse or unmarried children of any age to immigrate to the U.S. Generally, there is a waiting period. Identify other ways to move to the United States. Self-petition if you have extraordinary ability. People with outstanding abilities in the arts, sciences, education, business, or athletics can petition for a green card. Non-immigrant work visas. These are temporary visas that allow you to live in the U.S. for a certain amount of time. When the visa expires, you need to leave. Nonimmigrant visa are available for people who work in specialty occupations that require at least a bachelor’s degree, as well as for people of extraordinary ability. Your employer will file a Form I-129 petition on your behalf. Intra-company transfers. A business may transfer a manager or executive from a foreign office to a U.S. office. Your employer will file Form I-129 to start the process. Tourist visa. You can only stay in the US on a tourist visa for six months. You shouldn’t get a tourist visa if you intend to stay longer. You also can’t get a tourist visa if you intend to search for work. Student visa. Talk to your school about whether you qualify for a student visa. They can help you with the process. Apply for a nonimmigrant visa. The U.S. Department of State processes all paperwork. The State Department’s National Visa Center will review the paperwork and schedule an interview with you. NVC will schedule the interview when a visa becomes available for you. Accordingly, you might have to wait a long time. 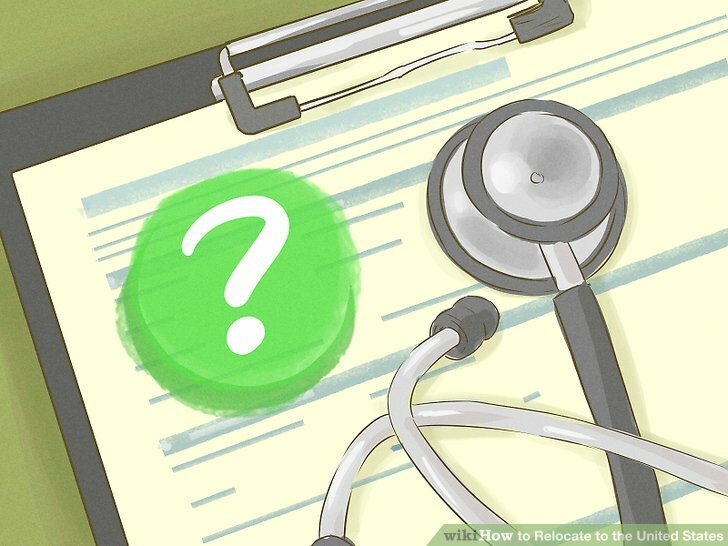 Before the U.S. will give you a visa, you may have to undergo a medical exam, receive immunization shots, and complete other tasks. 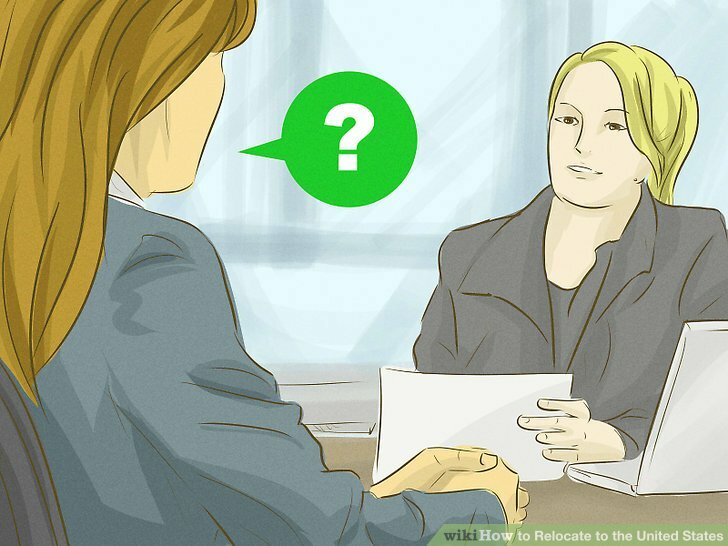 You want to give yourself plenty of time before your consular interview to complete everything. Now is a good time to make sure your passport is valid. You won’t be able to travel if it isn’t. Go through all passports for your family members and update any that are nearing expiration. You will finish processing at a Consulate or Embassy. 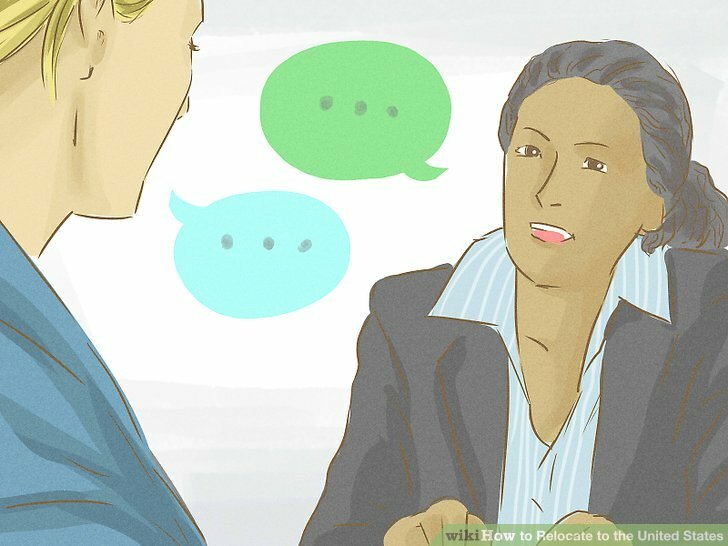 At the interview, you will review your application with a consular official. This official will check your financial, criminal, and medical records. Remember to always tell the truth to the consular official. 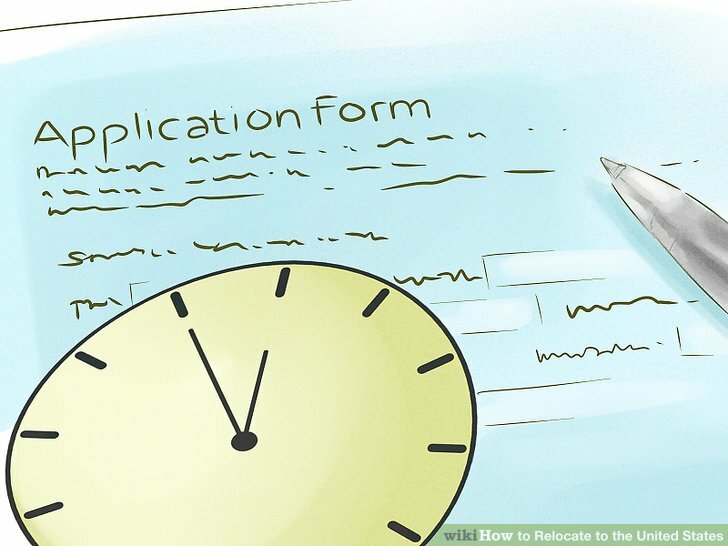 If you are approved, you will be told when to return to pick up your visa. Begin the search early. Depending on where you are moving to, it could take you some time to find something affordable. Housing costs in the U.S. are generally cheaper than in many European countries. However, housing in cities like New York or San Francisco is very expensive. Housing is advertised on the Internet. You can find housing on Craigslist or other websites. You can also hire a realtor to find housing for you. 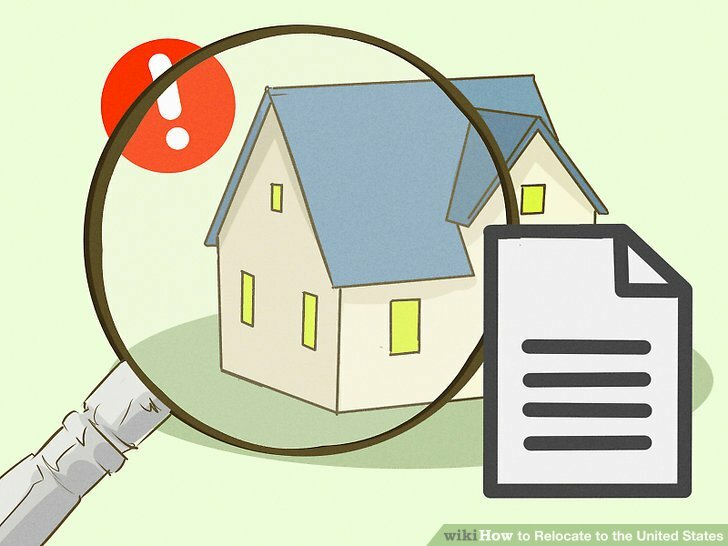 You might want to use a realtor only if you intend to buy a house or if you want a furnished executive apartment. If you have pets, make sure the apartment allows them. Not all apartments in the U.S. do. You can obtain a short-term visa to visit the United States if you want to check out apartments or houses in person. You can obtain a tourist visa by applying online. 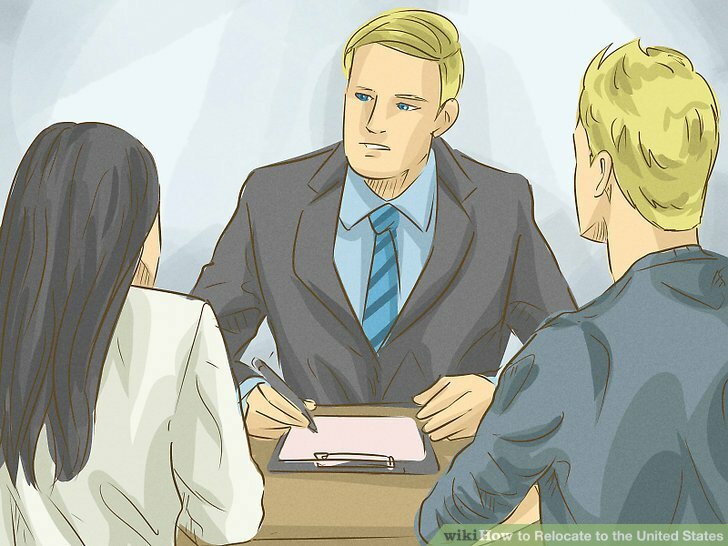 Work with the landlord to schedule a time to view the apartment. Note how clean and safe the building is. Are the stairs and hallways full of trash? Is the lobby dirty? If so, then the landlord might not be diligent. Think about taking pictures of each place you see so that you can remember what they look like when you are back home. Pay attention to the neighborhood. Some neighborhoods in cities are safer than others. Look to see if there is graffiti on apartment buildings or alleyway walls. Also check how many apartments have iron bars, which is a sign of an unsafe neighborhood. If you have children, also check how good the local schools are. Apartments leases typically run for 12 months. 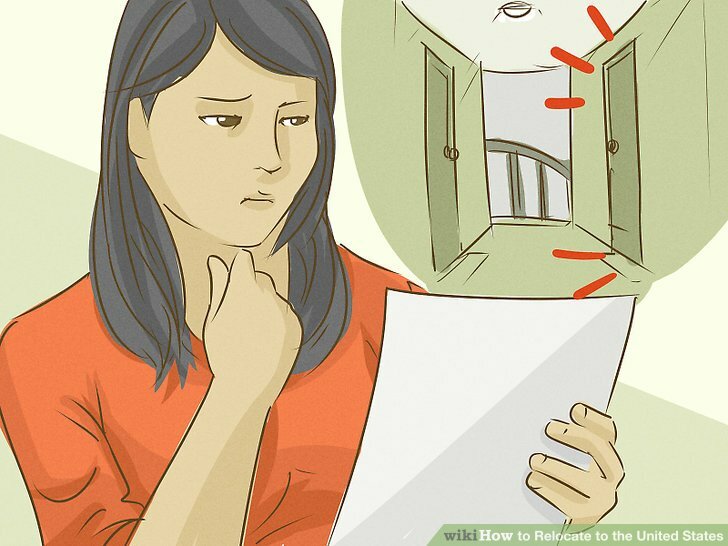 The lease should cover what you can and can’t do while living in the apartment. Be sure to read the lease thoroughly and agree to all terms before signing. You also can expect to pay the first month’s rent and a security deposit soon after signing the lease. Keep a copy of the lease for your records. You might want to wait to perform your housing search until you actually arrive in the U.S. In that case, temporary housing might work for you. There is usually a good supply of short-term housing available in large cities. Also think about AirBnb. This is a marketplace for short-term rentals. You can find and request rooms on the website. Decide what you need to take with you. 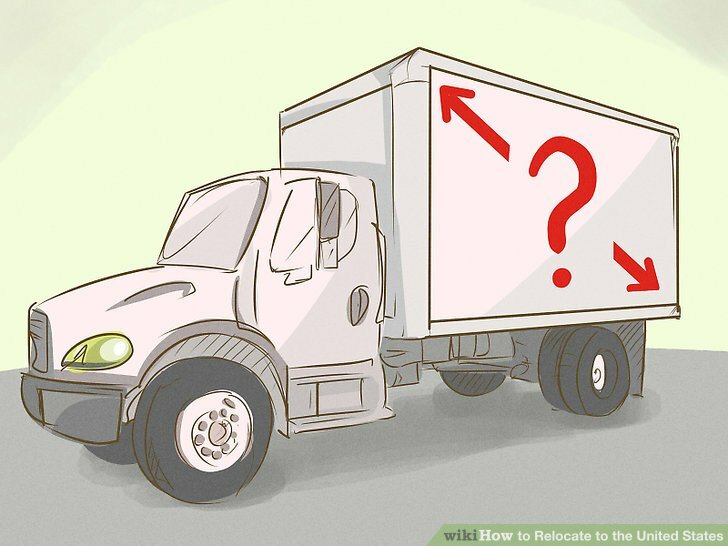 Unless you are relocating from Canada or Mexico, it will be difficult to transport large amounts of furniture to your new home in the U.S. Accordingly, you should decide what you absolutely must take with you. Once you settle on these items, create a checklist so that you will remember them on moving day. You might want to bring clothes and footwear. Remember that the U.S. is a big country with different climates. Hawaii is warm all year, whereas northern states like Maine, Minnesota, and Alaska have very cold winters. Think about renting storage for what you don’t need. Alternately, you could give it away. You can buy furniture in the U.S. for less money than it will cost to transport your belongings. If you intend to move furniture or other belongings, then you should begin researching personal moving companies. Call them up and ask for quotes. 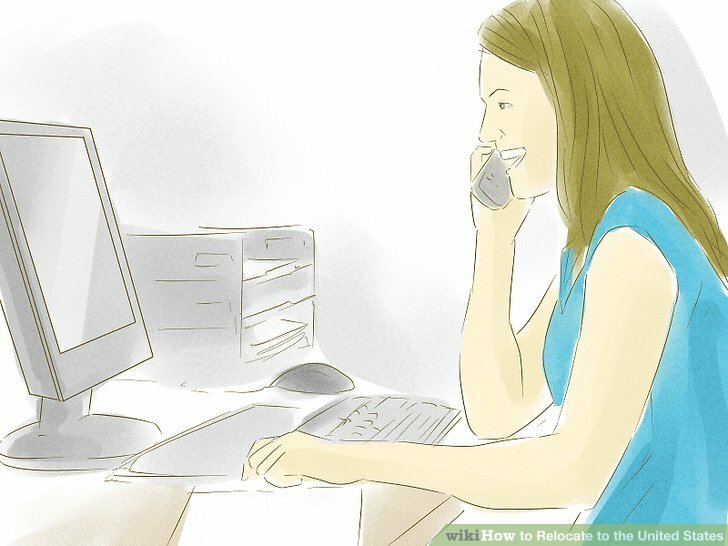 After comparing quotes, you should call the movers and schedule a day to come pick up your items. Get any instructions they may have for packing items. Go to your post office and tell them your new address. Ask them if mail can be forwarded. Also contact businesses directly and let them know your new address. You should find a nearby bank and create an account. You will want a checking account with a debit card. Many places in the U.S. accept debit and credit cards, so you don’t often need to carry cash. Getting a checking account will allow you to write checks to cover your expenses, such as your rent and utilities. Each bank will need to see different information from you. Think about talking to a branch representative and asking what you will need. You can gather the information and then return to open the account. 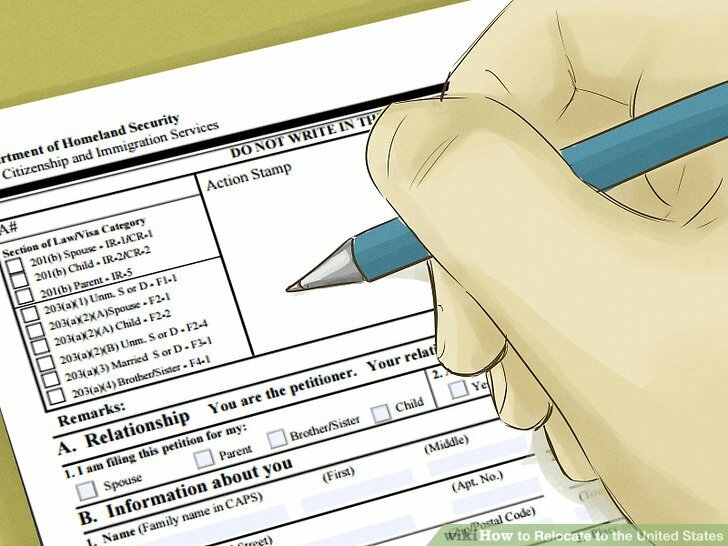 Generally, you need to present your immigration documents, proof of a physical address (such as your lease), your passport, and a Social Security Number (if you have one). Some banks are located inside and outside the U.S.: Citibank, HSBC, Barclays, etc. 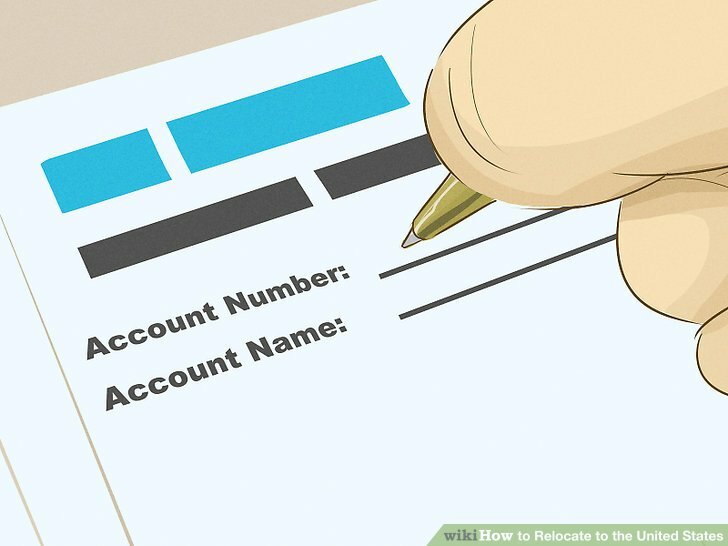 If you have an account with them, then they can help you set up a U.S. account. Find the nearest school district and contact the principal’s office. If you don’t know which district your children should attend, then stop into your city or county government’s office. Children are usually guaranteed a seat in their district, which is based on where you live. In the U.S., children typically start kindergarten at the age of five. However, many schools also now offer a pre-Kindergarten, which is for children ages three and four. To register in public school, you must typically present a copy of the child’s birth certificate or passport, immunization records, and any prior transcripts. Call the school directly to find out exactly what you need. You can also enroll your children in private school, which you must pay fees for. You can find private schools by looking online. The application process varies. Since your child isn’t guaranteed a seat in private school, you should begin the process as soon as possible—even before you leave home. Get a Social Security Number. 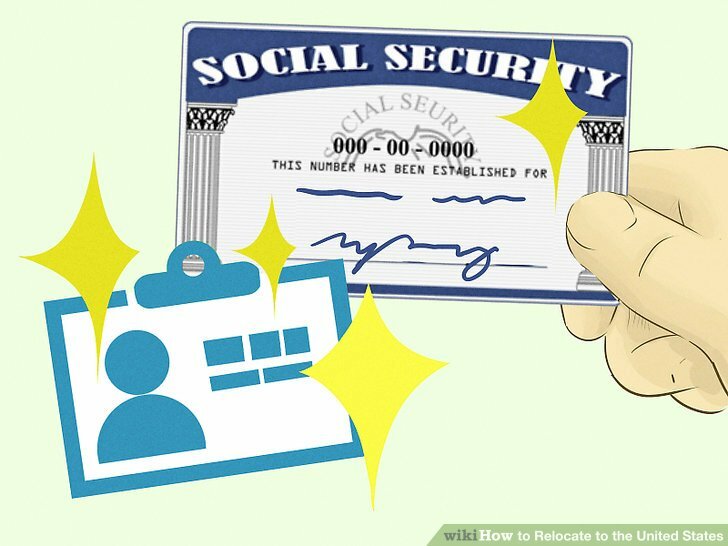 A Social Security Number is required if you intend to work in the United States. This number is used to report how much money you made and to determine if you are eligible for Social Security benefits, which are retirement benefits. You don’t need the number simply to get a driver’s license or open a bank account. You could have applied for the Social Security card when you applied for your visa. Check your application to see if you did. If you need to apply in the U.S., then visit your nearest Social Security Administration office. Wait 10 days after you arrive. 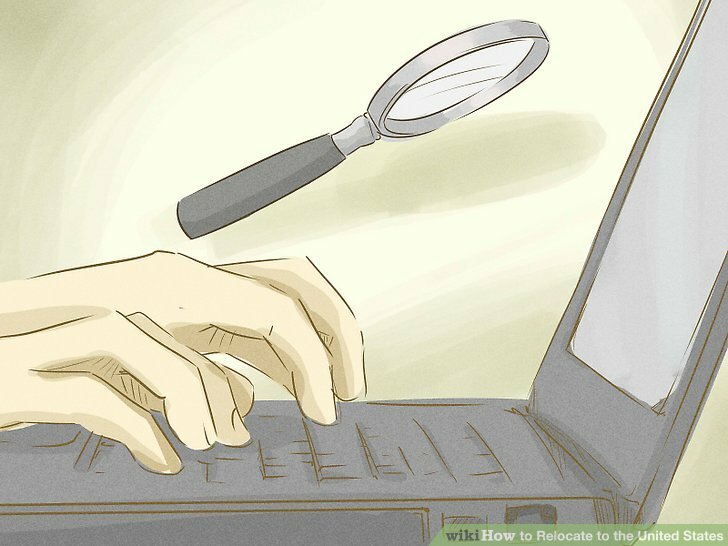 You must present proof that you are authorized to work in the U.S. For example, you can show a permanent resident card or other document. You also need to show your birth certificate or a passport. Call SSA at 1-800-772-1213 if you have questions. If you are a short-term visitor, then get an International Driving Permit (IDP) from your country’s motor vehicle department. The U.S. does not issue these permits. If you are becoming a U.S. resident, then you’ll need to get a license from the state where you are living. Contact your state’s Department of Motor Vehicles to find out requirements. Visit https://www.usa.gov/motor-vehicle-services and click on your state. laws. In the U.S., laws can be set by the federal government, each state government, and local governments. You should familiarize yourself with the laws. Remember that ignorance of the law is rarely a defense. Gambling is one area where the U.S. differs from many other nations. Gambling is tightly regulated in the United States. Sports gambling is illegal, and other forms of gambling (such as slot machines) are legal only in certain areas. For example, Utah has very strict laws against gambling, but the neighboring state, Nevada; is home to Las Vegas which is internationally renowned for ubiquitous casinos, slot machines and various other forms of legalized gambling. Learn local regulations, such as whether you need to clean off the sidewalk in front of your apartment or house after a snowstorm. If you don’t know if something is legal, ask a neighbor or stop into your local government office. You have to get a dog license in many places. Before you can get a license, your dog must be vaccinated against rabies. Cats generally do not need to be licensed, but you should think about getting them vaccinated as well. Hold onto your proof of vaccination. You may need to present this document to your city or county government when you license your dog. You should also think about having your pet castrated. 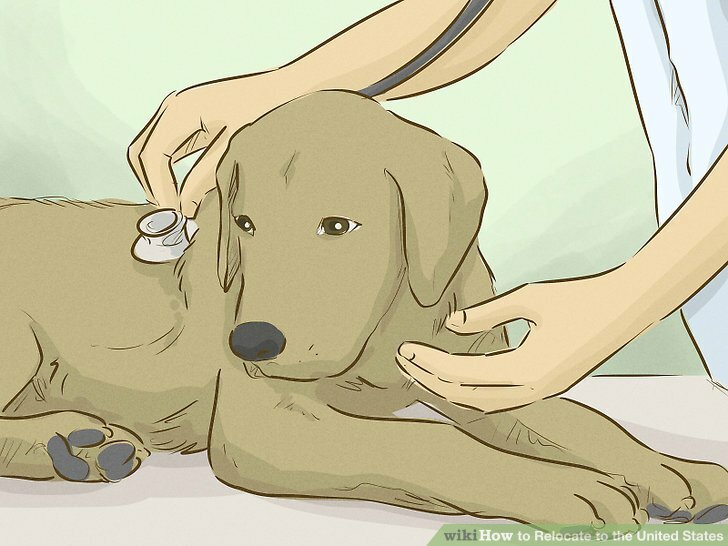 Typically, your licensing fee will be lower if your dog has been spayed or neutered. The U.S. has no official language. However, almost everyone speaks English and business is conducted in English. It’s okay if you aren’t great at English. You have plenty of time to practice your speaking skills. You might want to take a class. Many colleges offer English as a Second Language (ESL) classes. However, the best way to learn may be simply to get out and talk to people.